Established in 1969 as the House of Culture and Recreation Saint Étienne in France, the institution hosted shows and art exhibitions as well as theatrical productions, opera, and even dance and symphony in the 1980s. Renamed L’Esplanade in 1994, its main building was burned by arson in 1998, reopening in 2001 and later renamed Opera Theatre of Saint-Etienne in 2006. 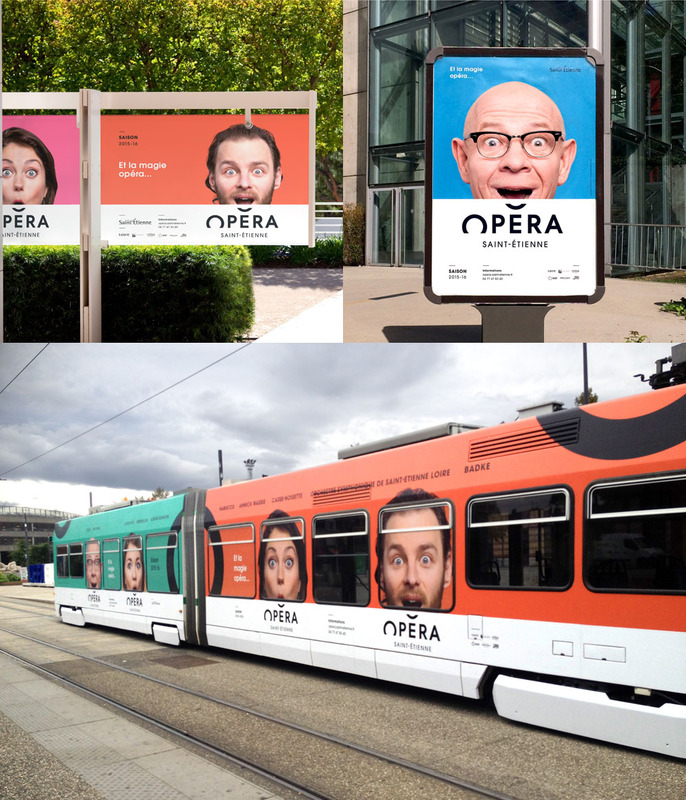 Now, it’s dropping “Theatre” from its name focusing only on opera and highlighting its Symphonic Orchestra and Opera Choir as Opera Saint-Étienne with a new identity designed by Lyon, France-based Graphéine. An unmissable architectural feature, the roof of the building looks as if it is giving a sign. With its location from the heights of the Jardin des Plantes park, the sign looks over the city. For Saint Etienne’s inhabitants it has become part of their landscape. Perfectly circular, the hall offers exceptional comfort and acoustics. On the top of the “E”, the accent stresses the syllable by increasing the intensity of the voice. It decks the word “opéra” with the image of the building’s pagoda. The shape of the “O” brings to mind an open mouth singing an operatic aria. The “O” is used to show a strong emotion such as surprise, admiration, joy, etc. In opera, music and dance are intimately linked through “movement”. This could be the movement of a body, of musical notes or simply the emotions* triggered by these two art forms. (* The word “emotions” literally means “to make movement” of feelings). The emotion behind this logo comes from the optical framing trick between an “O” and the “accent”. The “O” looks as if it’s disappearing at the same time as the accent appears. The old logo was fun, maybe too much fun. It had an interesting approach and clearly someone was having plenty of fun with the typography — I particularly like how they treated the tittles of the “i”s. The diamond shapes, though, and the color palette started to look a little like a casino. 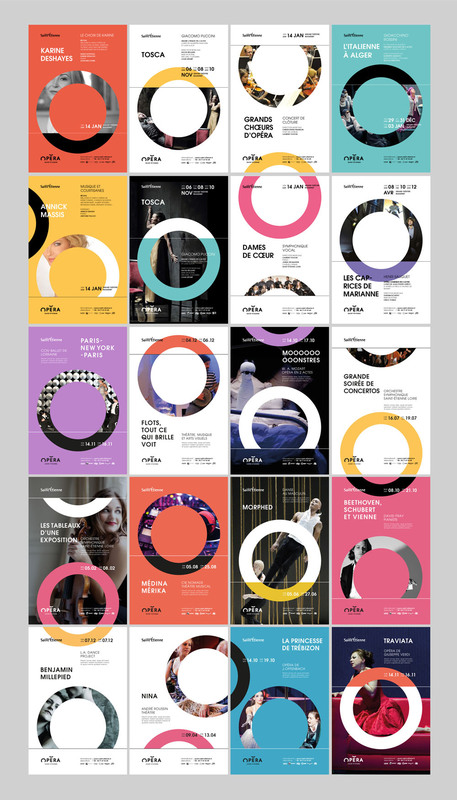 Dropping the theatre aspect has helped focus the logo by not having to communicate both opera and theatre. The new logo works so good on so many levels: first, as a visual cue to the roof of the building; as a metaphor for a narrative, with a thing that starts one place and ends in another; and, simply, as a lovely visual puzzle. The execution is great and the design is not heavy-handed, letting the concept shine through. 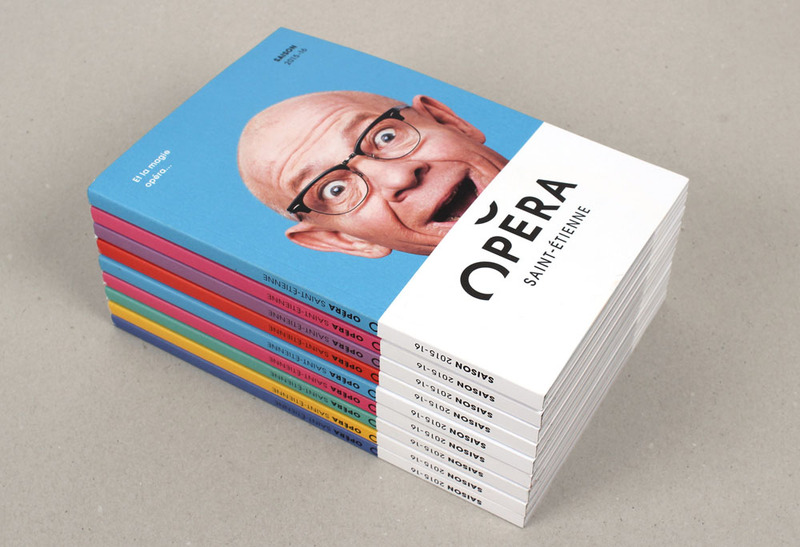 I do have to wonder if a more extended sans serif would have paired better with the wide “O” for Opera? While the stationery has a rather tame approach, the posters remind me of a light version of Studio Dumbar’s work, displaying great energy and composition while establishing a consistent visual language. 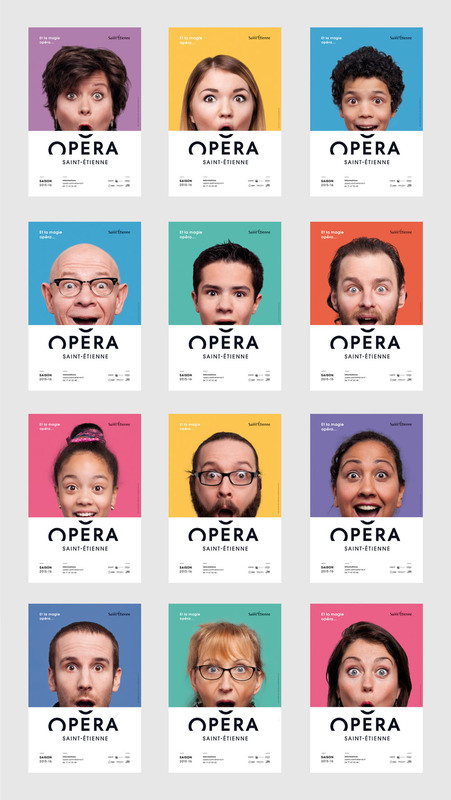 To inaugurate the new logo’s first season, we have come up with a simple and accessible communication campaign which features, in photos, all the staff members who work at the Opera. The logo is there to finish off the smile of the person being photographed, as if a curious spectator had come to peek through the Opera doors, wide-eyed at what they saw. So it’s about re-establishing a feeling of closeness between the people of Saint-Etienne and a popular cultural venue. 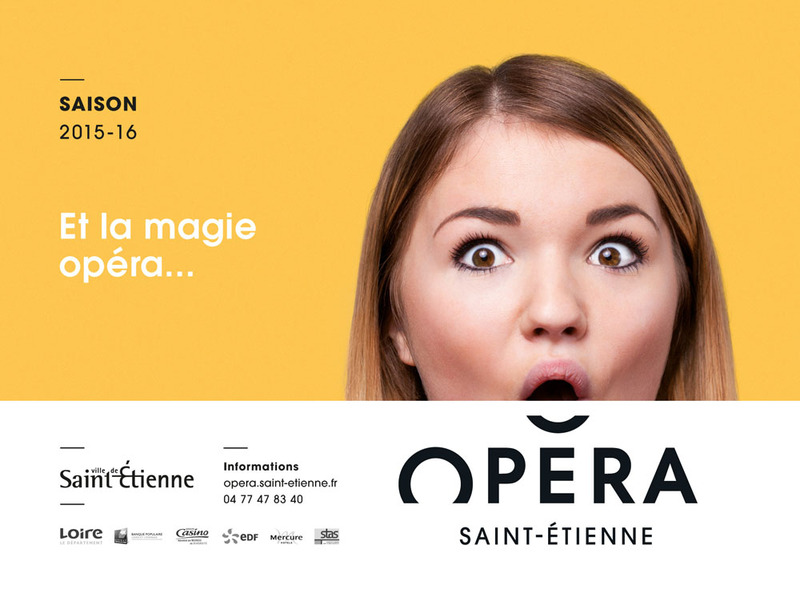 The campaign comes with the slogan “And the magic opera(te)…”, is a pun in France between the word “operate” and the word “opera”. 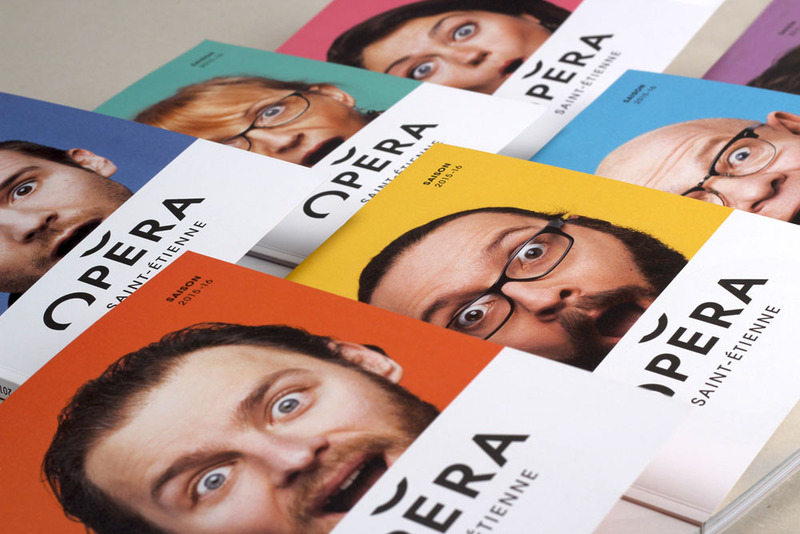 Going in another direction are this season’s materials that go for more warmth and sense of humor by showcasing the Opera’s employees in charming layouts where the bottom of their mouths are completed by the accent of the logo. It’s hard not to smile at it but, more importantly, it works perfectly to answer the client’s original brief which was for the institution to “re-establish a sense of closeness with the people of Saint-Etienne” and this campaign and brochure create that connection. Overall, from the simplicity and astuteness of the logo to the energy of the posters to the friendliness of the campaign, this is a wonderful project from start to finish where it’s clear that both client and designer were in tune. Established in 1969 as the House of Culture and Recreation Saint Étienne in France, the institution hosted shows and art exhibitions as well as theatrical productions, opera, and even dance and symphony in the 1980s. Renamed L'Esplanade in 1994, its main building was burned by arson in 1998, reopening in 2001 and later renamed Opera Theatre of Saint-Etienne in 2006. 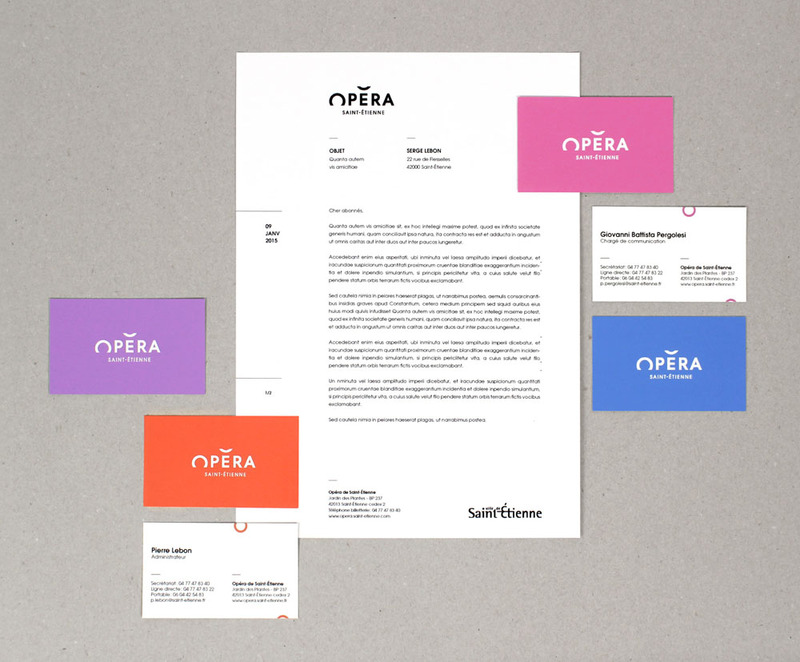 Now, it's dropping \"Theatre\" from its name focusing only on opera and highlighting its Symphonic Orchestra and Opera Choir as Opera Saint-Étienne with a new identity designed by Lyon, France-based Graphéine.